It was quite a while since I have been corresponding with Fredd of the UP Mountaineers. As part of UPM’s environmental consciousness drive, they have adopted a hectare of deforested land in the Ipo Dam watershed. For some time now, they have been painstakingly planting tree seedlings on the slopes of the watershed. Almost weekly the UPM members, along with other volunteers, come back to safeguard the planted seedlings and prevent weeds from choking the young plants. Fredd has invited me to come with them but I always beg off. Last Tuesday I got an email from him again asking If I would want to come. This time I was not busy so I did. I asked my fellow MTLA student Grace Servino to come along. Early Saturday both Grace and I met up with Fredd and his UPM colleagues at the MWSS compound in Old Balara. Apparently this trip to Ipo Dam was a joint undertaking between UPM, Manila Waters and volunteer employees of Procter and Gamble. We were surprised to find the P&G contingent headed by no less than Everest veteran Romy Garduce. I learned that Garduce has long been a P& G employee himself and has organized an EKO adventure group among his coemployees. This Ipo trip was their latest conquest. After Fredd has given us a rundown of what to expect, river crossing, hiking, little climbing, my less adventurous heart kept on nervously pounding. At about 8 in the morning we boarded 2 Manila Waters Canter Vans and made our way to Ipo. It took an almost 2 hour ride coming from Diliman to the watershed, passing thru La Mesa, Novaliches, San Jose del Monte and Norzagaray in Bulacan. Finally, at around 10 am we descended down the waterway ravine of Ipo and caught glimpse of the dam, which actually collects diverted water from Angat River (coming from Aurora and Quezon) and transfers them to subterranean pipes leading to the Lamesa basin and finally the households of Manila. Upon reaching the dam structure we immediately put on life vests, crossed the dam rim and embarked on fishermen’s bancas for a 20 minute boat ride to the reforestation site. We were all thankful there is a light overcast of clouds, sparing us from the basking heat in open water, leaving us to fully enjoy the sights of the site. The water rim was high eating up the base of existing vegetation. My neck elongated and my eyes were forced to a squint trying to get a glimpse of the plant species existing in the banks. It was surprising that there is impressive plant cover but we were told that the deforestation is not visible from the river. After a few kilometers of uninterrupted forest view we reached the reforestation site and we were greeted by signs of human habitation. For one there is a banca port leading to a few shanties and ultimately, a sari-sari store. Children were playing along the banks if not bathing in the semi clear water. As expected the parts near the habituated area had identifiable species, mango, cashew, commercial teak, dayap, papaya, cassava, domesticated banana, acacia; all these are alarmingly non-native species. But luckily the area was still wooded with a good portion of native trees. Grace and I were relegated to picture documentation of the event but more importantly, the existing species of native trees and shrubs. UPM has been reforesting the site mainly with narra seedlings. Documenting some of the other native trees would aid in knowing what other species to throw in the mix. I always thought of my friends Lenna and Jimson Ong as my Cebu-connection. Lenna and I, being landscape professionals, share the same interest in plants. I usually do not hesitate in asking her to find certain Cebu plants and last year she and Jimson sent me a 3 foot high samuyao or Citrus westeri (which I trimmed down to bare branches so it would become more compact) . Today the Samuyao is at a prominent corner or our roof garden. And everytime I see and scrutinize my samuyao, I am always reminded of Jim and Lenna. Last month, tragedy struck the Ong household as their six year old son, Lander, passed away due to dengue complications. Adi, as his parents fondly call him, was always at Lenna's side when we confer about landscape and plants over the internet via email messenger. Sometimes while typing replies to Lenna, ADI, ADI, ADI would reflect on screen. Adi would usually grab the keyboard from Lenna, and type his own name, which Lenna said was the first thing he learned to type in the computer. Right after Adi's death, I never got to talk to Lenna over the internet. Her name in my yahoo messenger, which was available during most times of the day, was suddenly always unlit. Last Tuesday I woke up to get to work early. But in the course of my daily routinary preparations to get to the office, I managed to sneak-in a peak of the samuyao. It had a very tiny white flower with a faint sweet smell. It was the first time the samuyao flowered in our garden. When I reached the office and turned on my computer, Lenna's avatar was surprisingly on. I learned from her that she was still sad but that day was special, it was Adi's birthday. We exchanged our usual pleasantries before I remembered to tell her about the samuyao bloom. I would like to believe it gave her a smile to learn the Citrus bloomed on Adi's special day. Starting this day I would not only remember Lenna and Jim when I see the samuyao but also Adi when it again flowers. I would give extra care to it to help protect Jim and Lenna's, and Adi's as well, legacy in my native plant collection. The Palawan cherries are in flower! This tree is probably the nearest we could have to approximate the cherry blossoms of Japan. It is fondly called balayong by the people of Palawan and they have a festival named after it to celebrate its season of bloom, which is about now. Palawan cherry is actually a paradox. There are certain aspects of it being argued and one of it is its name. For one its common name is a misnomer. The Palawan cherry is not a close relative of the Japanese cherry blossoms, but it is actually nearer in association with the legumes or the likes of acacia, narra, kamatsile, ipil and tindalo. Why it was named such is that it flowers fully with pink blossoms covering the whole entirety of the tree, much like a cherry blossom. Cherry blossom (several species of Prunus - we have native Prunus but not as showy as the Japanese counterparts) could not grow in tropical climates like in the Philippines. Field botanist Leonard Co tells us that balayong is Cassia nodosa, a species native also to the island of Java, in Indonesia. In fact Mr. Co also states that Palawan cherry is not a native but rather prehistorically introduced to Palawan. But on the other hand, Dr. Madulid's Plant-cyclodia states that it is Cassia x Palawan Cherry, x meaning it is a hybrid between two or more species, a none pure species. I am not certain which species are claimed to be the balayong's parents, but most probably if this is factual, the Cassia nodosa is prime suspect. There are a lot of balayongs in Palawan which is why it is arguedto be native to the island. If you are in Quezon City and would love to see specimens in flower, the trees lining the main road inside Manila Seedling bank are in full bloom. If you ride the MRT train coming from Makati, look over to your right, after the Quezon Avenue Station to see a bird's eye view of them. If you are in Manila, you could ride the Metro Ferry and view the specimens lining Malacanang Palace on the Pasig River side. Only draw back is that you won't get to take pics of it in this route. Prof. Mary Ann Espina was pointing out in class that it is important for landscape students to know and see the flowering season of trees. The presence of flowers in landscape plant species is definitely a plus factor for softscape selection especially when candidates have spectacular blooms with colorful displays and unique scents. She encourages the students to literally go out and smell them flowers. She specifically mentioned the narra, but its magnificent yellow sprays last only a couple of days and most probably they have fallen by now. February and March are actually good times to find these species as most of them are in flower after the long cold season. In the Universtiy of the Philippines, Diliman Campus alone, there are quite a number of interesting species with worth while inflorescence to see. Hope some of you could catch them. An impressive exhibiton of upright flowers can be seen in most siar or Peltophorum pterocarpum specimens. They have the most showy among yellow flower bearers (probably second only to the golden showere or Cassia fistula, which is not native) . Siar is disputed as native with a few botanists claiming large trees could be seen in old Philippine forests. A rare tree to see is supa or Sindora supa. That is why to see it in flower in the metro is actually worth the sighting. The flower would eventually yield a number of seed bearing pods. I only know a lone supa specimen in the Diliman campus, it is located at the back of the Bahay ng Alumni, beside another beautiful tree-amugis. A revelation is a small tree at that end of the pathway coming from Vargas museum to the lagoon. The tree stands married to another native, kalios or Streblus asper. It is salingbobog or Crataeva religiosa, which could be found growing on limestone cliffs of Palawan. Yellow and peach orchid-like flowers cover the entire extent of its branches. The biggest display is the white flowers of katmon or Dillenia philippinensis. They are short lived lasting only till noontime. But the specimen in front of Melchor Hall has a lot of buds that would probably open up in the following weeks. I got a dose of Plant Taxonomy 101 in UPLB yesterday. I was inquiring about a few tree species in Mt. Makiling with Prof. Nelson Pampolina and he suggested that I attend a forestry class instead. So as early as 8 am I took a bus going to Los Banos and close to noon I was already in the Upper Campus. At exactly 1 PM I found Prof Pampolina's class on the front steps of Forest Biological Sciences Building. The students were all like they were going to the market place, equipped with a bayong, a bolo and a hard hat - tools they use in entering the forest and collecting samples. At that instance they were conferring with each other and murmuring softly the names of plants I have not heard of. When the professor emerged from the FBS building he herded the students under the towering canopy trees (which include the likes of tekla, amugis, bolon, lanutan and a lot more). He instructed them to form a circle at copying-proof distance. Apparently they were going to have an exam. The students brought out clipboards, paper and pen. Immediately the lab assistants brought out their loot from within a nylon bag - 50 pieces of cuttings from different plants all around the forest campus. The exam requires the students to name the plant's biological and vernacular names and the plant family it belongs to. The cuttings were passed around. I sat around with the class, most of the time inquiring with Prof Pampolina the variety of native plants suitable for landscape use. But in between I try to look at the 50 specimens circulating, seeing how i would fare in identifying them. I think I fared poorly as I could only identify around 14 species. Students appear to be also having a hard time but some just breezed through the identification. Sigh! Prof. Pampolina was telling me that the Landscape Arch program in Diliman should have some sort of link to UPLB Forestry and Horticulture. BLA or MTLA students should be required to take a few native flora classes in UPLB to strengthen their backgound not only in taxonomy but also their knowledge of Philippine flora. In doing so the landscape people could earlier know the going-ons in the propagation and maintenance of their primary landscape material-softscape. After the exam Prof Pampolina gave me a short plant tour of the forestry area. I found muh more promising tree species, apart from the plants already in my list. Just goes to show that here in the Philippines we have a rich plant palette to use, if we only know how and where to use them. I always look forward to February because it is the start of flowering season. For one it also signifies the season for fruiting, meaning mangoes would soon be selling cheap, and the varieties all so sweet. The sky is also so bright that it is ideal to take pics. So I usually set aside one day to go around and take pics of my favorite trees in flower. But this year, my most anticipated tree to picture was fallen. One of the most spectacular tree finds in the Philippines is Bombax ceiba. It is closely related to kapok or Ceiba pentandrum, that is why it is called malabulak. This tree is disputed as native but is very much visible in beach and coastal areas of the Philippines. 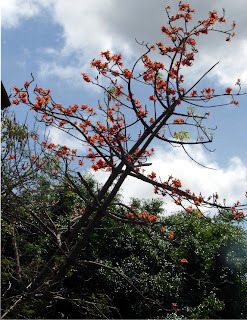 I usually hear of tales, in Bohol, of a huge flame red coastal tree and I suspect that what they refer to is this. Bombax ceiba flowers towards the middle of February. It usually loses its leaves during the cold months and February is greeted with appearance of numerous large scarlet flowers. This is a sight to behold as the tree is fully red (because it is only in flower and devoid of leaves). The very first time I saw malabulak was about 4 years ago. I passed by Sikatuna Village where V. Luna and Maginhawa streets meet and was surprised to find a very large Bombax tree in flower. I immediately got off the taxi (i was enroute to Cubao that time from UP) just to take pics of my amazing find. And from then on the Sikatuna Bombax became my yearly pilgrimage to look at. This year I forgot to visit my landmark malabulak. I was out of town and became busy with work backlog. But when i finally remembered about the Bombax, Prof Ed Gomez gave me bad news about it. Apparently the owners of the land it was growing felt it had no more importance and cut it down. The last thing Prof. Gomez saw was the cut trunk. Mike Asinas of Ayala Land chanced upon my web page. He was looking for supa pictures when he stumbled upon my blogs. He was excited that he found another person sharing the same passion for native flora. Mike then invited me for an ocular of Ayala Land's Alabang nursery. He said they got interesting trees propagated there and a good portion of it is native. I never say no to a chance to find and take pics of native flora. I asked Prof. Ed Gomez if he would want to come and he said yes. So both the good professor and I met Mike in Alabang Town Center last Saturday and proceeded to the nursery. It was located near one of the Ayala's new developments. Even before I met Mike I already noticed that the new Ayala undertakings were starting to use native flora in their projects. The Fort in Taguig had dapdap (Erythrina variegata), bitaog (Calophyllum inophyllum), dita (Alstonia scholaris) and katmon (Dillenia philippinensis) among other trees in their landscape palette. I was expecting to find some new trees to add to my thesis list. And what we saw did not disappoint us. The Nursery was actually a remnant of recent Ayala landscape undertakings. Some trees were imported from Australia, courtesy of the The Fort's previous developer, but Mike and his mentor boss (a female engineer who recently retired from the company) found ways to integrate propagating some native plants into the mix. There we found a bevy of trees growing beautifully, sourced from nearby provinces. Some were existing flora from Ayala developments like Anvaya Cove in Bataan. Mike and the Ayala staff collected seeds and propagated them. Native trees were clumped together with introduced species like Brachychiton acerifolius (red flame tree), Garcinia xanthochymus, Xanthostemon chrysanthus and Tabebuias. But the local trees do not fail in comparison to the imported ornamental trees. Sapindus saponaria which Mike fondly calls the soapberry or kusebeng. He got the seeds from his Hometown in San Pablo, Laguna. It has fine pinnate leaves looking like a lace oak (which also reminds me of Quassia amara). The berries of kusebeng are used by the tagalogs as soap or hair perfume. The pendant berries also attract some local birds and are eaten by them. I googled Sapindus and it turned out this species was introduced, to our dismay because it is a beautiful tree. This native santan was found in the Anvaya cove site and grown in the nursery. I believe this is native, probably Ixora philippinensis. It has small clusters of white flowers. This plant is called Taxus sp. in the nursery. The plant looks like a small version of igem or Podocarpus - another native genus. The plant, said mike, does well better in colder climates but the specimens in the nursery are well established. A few Taxus species grow native in our forests. This another unknown tree coming from the coasts of Anvaya Cove. Seeds were collected from the beach and grown here at the nursery. They resemble Heritiera or dungon late with a green leaf face with silver undersides. The leaf shape varies from maple-like when young to almost obovate when tree matures.